The amount and type of personal information we collect is entirely dependent on the way in which the website is used. Personal information is collected by us during the following circumstances. When purchasing from this website, we ask you to provide information which includes your name, delivery address, email address, contact phone number, age and credit card details. When subscribing and registering interest in our products via this website we ask you to provide information which includes your name, email address and age. This information may be used to send you marketing and/or promotional information. When completing our customer surveys or promotions we ask you to provide information which includes your name, email address, age, interest, hobbies and thoughts. During browsing of our website we may also automatically collect your IP address, browser type, domain name and website access times. What happens with the Collected Personal Information? Information collected by us is only used to fulfil the requirements related to the purchase of products from this website and to increase our knowledge of users and subscribers of the website in order to improve the ClubShop website experience and our products and services. Essentially information is only used for the primary purpose for which it was provided. No personal information is shared with related companies or third party businesses with the exception of our banking agents and those businesses directly involved in the delivery of your order. 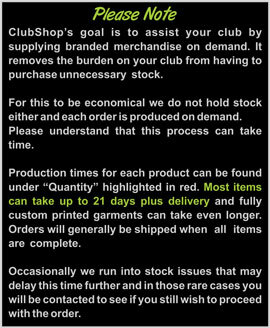 The team at ClubShop are strongly committed to protecting the privacy of all our website users, subscribers and purchasing clients. NOTE: Personal information may be released if lawfully requested under local, state or federal legislation. All information collected by us is stored as electronic data. Restricted access to this information is controlled by user identifiers and passwords and is monitored. Electronic data storage is kept under physical security. All credit card transactions are handled by an established and secure third party banking agent using industry standard encryption technology for the transfer of monetary funds. We offer a number of ways for you to access and control your personal information. If you have an online account on the website, you can log on at any time to update or change your personal information. You may write to us at the postal address or email address below and ask us to update your or change your personal information. You may write to us at the postal address or email address below and ask us to remove all your personal information from our database. You may un-subscribe to our email newsletter by following the un-subscribe instructions at the base of the newsletter.